The Halo 3 Scale Replica Weapons are collectors' items replicating the human BR55HB SR Battle Rifle and the Covenant Type-51 Carbine. At six inches from end-to-end, they are available for purchase at online retailers and at Gamestop. 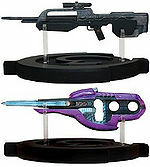 Although the only scale replica weapons available are the Battle Rifle and Covenant Carbine, there are also full scale versions of the Plasma Pistol, Energy Sword and Plasma Rifle that were released in 2008, which also include sound and light effects.